As part of ABUS' continual product improvement the 83/55, 83CS/55 and 83WP/63s have all been upgraded to a 6 pin keyway offering greater keyed alike and master keyed flexibility through significantly more differs and further anti-pick security. These mid security 83 models have consequently gained the coveted Silver Sold Secure approval, complementing the existing 83 Bronze and Gold Sold Secure models. ABUS' 83 range offers a complete security spectrum from 45mm aluminium to 80mm hardened steel bodies. Cybercriminals on the lookout for a vehicle to hack may soon face stiff opposition, as experts claim to have made the first hack-proof car. ODSecurity selected for major Canadian through-body scanner contract? Netherlands based security systems manufacturer, ODSecurity, and their Canadian distributor, Visiontec Systems, have announced the award of a contract to supply 29 Soter RS Through-Body Scanners to the Ministry of Community Safety & Correctional Services, Ontario, Canada. More than 5 billion IoT devices were installed in 2015. Gartner estimates this will grow to 20 billion by 2020. Unfortunately, experts agree that security is not only an afterthought, but often is actively resisted and circumvented. Aurora's FaceSentinel in Identification Mode allows users to pass through security doors without cards, tokens or codes. A world-first in access control technology that allows registered users to open doors simply by looking at a sensor, with no need for any additional verification such as tokens, cards or PINs. The SECO-LARM Miniature Single Photobeams, E-961-S50TB (single-frequency) and E-964-S50TB (multi-frequency), are simple, easy-to-use, and easy-to-install single-beam infrared motion sensor. The devices easily install almost anywhere to provide an invisible beam that, when broken, sends a signal to activate a light, beeper, or other device. Sargent & Greenleaf (S&G), a subsidiary of STANLEY Security, hosted over 40 industry distributors from 24 countries including Sweden, New Zealand, China, Ecuador and United Kingdom during its Global Distributor Meeting in May. It used to be that only locksmiths used bump keys - a modified key that can be used to open many kinds of locks -- but now anyone can buy them online, and police are worried because the keys are increasingly being used in burglaries across the country. In some cases people don't even know they've been burglarized. That's because bump keys can be used to break into your house without leaving a trace. New MobileKey from SimonsVoss enables facility managers to have full control over building access. SimonsVoss is a leading electronic lock manufacturer and brand of Allegion. MobileKey is suitable for a variety of buildings, including commercial offices and healthcare applications. MobileKey provides state-of-the-art technology and offers the end user simple, keyless locking by replacing a traditional lock with an electronic cylinder and standard keys with a transponder, PIN code keypad or an app on users' own smartphones. Talisman Security Products, a leading UK domestic manufacturer, and supplier of tamper evident security seals is pleased to announce the release of a completely new product to add to their current extensive portfolio. The Easiloc 'Tear Off' pull tight seal has been designed with the customer in mind, and is a security seal with an easy to use 'tear off' feature. The very nature of being a modern day locksmith is that he answers the needs of his customers locking security needs, and that more often than not is to repair, replace or upgrade an existing lock. One aspect of the work that I have always particularly enjoyed is when I'm called to a property or indeed to a safe or even a piece of furniture, where the lock has failed or the key is lost. With 37,000 students on campus and 200 facilities staff with access to certain keys, the Manchester Metropolitan University (MMU) security team face the challenging task of keeping everyone and every asset secure. However, Traka, the key and asset management specialist, has lightened the strain and placed accountability on to the key holders, raising security awareness amongst the staff. Deals and demos galore at the Tradelocks Open Day! Don't forget to register for the Tradelocks Open Day on the 20th of August to get your hands on the very best Tradelocks deals and the opportunity to win HUGE product giveaways! Register to the Tradelocks Open Day and be in with the chance of winning big in their raffle - With over £500 in locksmith tools to give away you won't want to miss out! David Jennings, UAP MD said, "We have some very big giveaways in our raffle prize draw, including pick sets, cloning accessories and money off vouchers. First prize is a big one - but you'll have to register for the event to find out what you can win." Holiday season is here and as many of us prepare to jet off on our holidays, it's inevitable that some of us will sadly fall victim to burglaries at our destinations and at our unguarded homes. With recent home security research by Safe.co.uk showing that three quarters of Brits know somebody who has been burgled, it comes as quite a shock that only a quarter have security alarms fitted to their homes. Even more worrying is that more than a quarter of people admit to leaving their house with the back door unlocked. A local locksmiths business, founded by ex-soldier and dyslexia sufferer, Eyan Maloney only four years ago, has been approved by the Master Locksmith Association. The Master Locksmiths Association (MLA) is the UK's leading trade association for the locksmith industry, helping trainees work towards becoming vetted and fully inspected locksmiths. Awareness of the growing threat of lock cylinder snapping is surging amongst trade professionals and the general public alike. Locksmiths, security specialists and householders are increasingly visiting the Door & Hardware Federation (DHF) website to find out more about the BSI Kitemarked TS 007 three star solution. In the last year, the TS 007 information page on the domestic householder section was the most visited page on the entire DHF website after the main home page. Send For Help Group - the world's largest lone worker protection provider, has been re-elected its two committee memberships of the British Security Industry Association's (BSIA) Lone Workers Section; one for each of its subsidiary companies. Will Murray, Marketing Director, has been re-elected as representative for Guardian24, and Ben Hawkins, Incident Management Centre Manager, has been re-elected to represent Skyguard. Tradelocks Open Day date change! There'll be more deals and special prices than ever before at the up and coming Tradelocks Open Day, which will now be held of the 20th of August. Valuable advice on how to meet the new security requirements within the English Building Regulations has been published by the Door & Hardware Federation (DHF) which represents the UK's leading manufacturers of door and window hardware and locks. Pickersgill-Kaye reported brisk business following the Home Office's 2016 Security & Policing Exhibition in Farnborough, with the manufacturer of high security and custodial products attracting encouraging sales enquiries after displaying its range of locks and hatches. 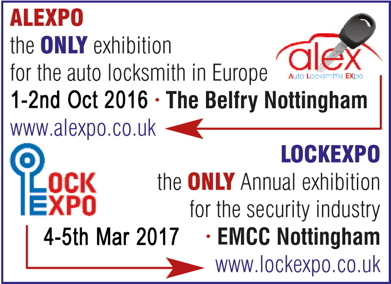 The Leeds based company, which designs and manufactures all its locks in the UK, recently posted a sales increase to £3.5million for 2015 and is confident of another successful year after generating many enquiries as a result of exhibiting at the security industries' showcase event. As part and parcel of managing the health and safety of any business and its employees, it is essential to conduct regular risk assessments to identify potential risks in the workplace and to implement the appropriate physical security measures.